N.K.Rubber Industries offers you high quality rubber components conforming to international standards which ensure high precision, patient heat resistance, good chemical stability and long term durability. 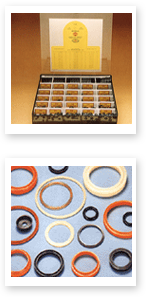 Our production range includes O-rings, Sealing rings, Washers, Bushes, Gaskets, Pressure Cooker Gaskets, O-ring kits and many more. The polymers which we use as our main raw material, are VITON, Fluorosilicone, Silicone, Hypalon, Polyacrylate, Flame retardant silicone, Neoprene, EPDM, Nitrile, Nitrile/PVC, HNBR etc. Our products provide good resistance to most of the gases, greases, chemicals, oils, fuels, water, abrasion, high and low temperature, etc.